AccordingtotheScriptures.org :: How Do Oysters Climb a Mountain? How Do Oysters Climb a Mountain? Recently I asked a university student how they thought fossils were formed. Of course they gave the common answer that most of us were taught in the public school system. They explained that over long periods of time layers of dirt slowly covered the dead animals and millions of years later you have a fossil. But is this really the true answer? Has anyone been around that long to observe this? I asked, what happens when a fish washes up on the shore of the beach? Does it hang around to slowly and uniformly get covered up over millions of years? No! What we usually observe is that some scavenger comes along and takes advantage of a free meal, otherwise it would lie there and rot till there is nothing left. How then are fossils formed, and how long does it take to form a fossil? There is observable evidence, which reveals that it does not take millions of years. There are fossils that exist of recent items such as a hat , fence posts, a waterwheel, fence wire , etc. These were turned to stone by minerals entering and replacing the cell structure of the article or plant or animal. It is obvious that all fossils are made of rock and are themselves found trapped in rocky strata unless exposed by erosion. This rocky strata was previously sedimentary deposition that covered those creatures very rapidly to preserve them from any oxygen that would encourage decomposition. The question then is how could they have been buried so rapidly? There is only one reasonable answer and that is through some massive catastrophe, perhaps a great flood or a volcano, or both. It is interesting that the Bible mentions a great catastrophe of worldwide proportions. The Bible tells us "all the fountains of the great deep [were] broken up, and the windows of heaven were opened. And the rain was upon the earth forty days and forty nights � And the waters prevailed exceedingly upon the earth; and all the high hills, that were under the whole heaven, were covered. Fifteen cubits upward did the waters prevail; and the mountains were covered. And all flesh died that moved upon the earth, both of fowl, and of cattle, and of beast, and of every creeping thing that creepeth upon the earth, and every man: All in whose nostrils was the breath of life, of all that was in the dry land, died. And every living substance was destroyed which was upon the face of the ground, both man, and cattle, and the creeping things, and the fowl of the heaven; and they were destroyed from the earth: and Noah only remained alive, and they that were with him in the ark. And the waters prevailed upon the earth an hundred and fifty days " (Genesis 7:11-12, 19-24). Modern "science" (1 Timothy 6:20) has recently excluded the possibility of a world wide catastrophic flood to explain the sedimentary layers with their fossil record and replaced it with their doctrine of uniformitarianism . This was the basis of the answer that the university student had given me to explain where the fossils have come from. Until modern times though, the generally accepted belief was that which is recorded for us in the Bible, in the book of Genesis. That is, the Earth had been created approximately six thousand years ago, and after around 1600 years a great worldwide flood upset the continuum. The world's sedimentary rocks, and strata, with their fossil record were believed by some geologists to have been formed when immense quantities of minerals precipitated out of the waters of the Biblical Flood. This view was called catastrophism , which based its views of geology on the catastrophic events of the Genesis Flood. In opposition to the "catastrophic view" of geology, we have the evolutionary doctrine of uniformity . Encyclopedia Britannica states, "the principle of uniformity postulates that phenomena displayed in the rocks may be entirely accounted for by geologic processes which continue to operate at the present day-in other words, the present is the key to the past. " What this statement is suggesting is that there was never a great upset in the continuum since the beginning of the Creation. In other words, since we have never seen a worldwide catastrophic flood in our day, it never could have happen. Since we do not see enormous layers of sediment forming rapidly today, they must conclude that the thick layers of strata (in some places hundreds of meters thick) that now exist must have been formed over millions of years. Their conclusion is that if it takes hundreds of years to form an inch of soil, it must take millions of years to form the thousands of feet of geological strata that can be observed today. The originator of uniformitarianism , James Hutton (1726-1797) first challenged the concept of a Biblical earth (with its 6000-year history) that was specially created to be the home for man. Charles Lyell (1797-1875) then adopted Hutton's views and rejected any form of supernaturalism in regards to the Earth's geological strata. Lyell's work in turn profoundly influenced Charles Darwin (1809-1882) who extended the principle of uniformity to the plant and animal kingdoms. "The principle of uniformity postulates that phenomena displayed in the rocks may be entirely accounted for by geologic processes which continue to operate at the present day-in other words, the present is the key to the past. " This view maintains that the "geological column" with its fossil record has been formed very slowly over billions of years and continues to be formed today as it has from the very beginning of the creation. But obviously, the geological column with its record of death, (evidenced by the billions of fossils contained therein) point to some great catastrophe that caused these life forms to be quickly buried within the sedimentary strata, fossilizing them. "there shall come in the last days scoffers, walking after their own lusts, And saying, Where is the promise of his coming? for since the fathers fell asleep, all things continue as they were from the beginning of the creation. For this they willingly are ignorant of, that by the word of God the heavens were of old, and the earth standing out of the water and in the water: Whereby the world that then was, being overflowed with water, perished " (2Peter 3:3-6). Contrary to the predominant uniformitarian thought of the day, the Lord says that all things have not continued as they were from the beginning of the creation, but rather, there was a worldwide, mountain covering, yearlong flood that upset the continuum leaving behind it a record of death in the sedimentary strata. "The world that then was, being overflowed with water perished". Only those creatures on the ark survived. This is the true account of the earth's history and its geological record. What the scientists think would take thousands of years to accomplish, the Lord can do in one day, for "one day is with the Lord as a thousand years" (2Peter 3:8). The scoffers of the last days would use this great lie of evolution to deny God's truth in general, and the promise of His coming to set up His kingdom. Another misconception that many have is that the only fossils that exist are that of extinct animals like the dinosaurs, and ancient marine life etc. While extinct fossils are the ones that are primarily shown in the schoolbooks, there are fossils of many creatures that are still living today. There are also many creatures that were once thought to be extinct for millions of years that have recently been found. These are referred to as "Living Fossils". Consider the Coelacanth that has been dated back by "scientists" to around 400 million years ago, which were thought to be extinct for the last 70 million years. Recently a diver took a picture of one while diving off South Africa's northeast coast, and others have been filmed as well. Many other "Living Fossils" of plant and animal life could be mentioned as well but this one has been included for brevity. Why are there no dinosaurs today? There are no dinosaurs today because they became extinct the same way that all other species become extinct. Either their habitat was destroyed or the food they needed to survive became scarce, or other predators killed them off. While we find fossils of all kinds of animals today that likely perished in the Genesis Flood, we know that two of every kind were on the ark, including the dinosaurs (Genesis 6:19-20), so it was not the Flood that caused their extinction. Once the ark landed on dry ground, environmental conditions would not have been as friendly as before the Flood (colder climate, reduced vegetation and food supplies etc). Some of these creatures, because of their small numbers (2 of every kind) could have died off in the early years after the Flood. The only remains that might now be found are of those that perished in the Genesis Flood. If the water was as high as 3000 meters above sea level as the above Free Press article claims, very little of the world would have been left standing out of the water. All of the USA and Canada would have been under water except for a few peaks in the Rocky Mountain range. All of South America would have been under water except for parts of the Andes Mountain Range. All of Europe would have been flooded except for a few portions of the Swiss Alps. All of Russia, the Middle East, Africa, Australia, and India would have disappeared except for the peaks of the highest mountains. Here is what it would have looked like. Looks like a worldwide catastrophic mountain-covering flood to me. If the world was covered with water up to the 3000-meter level, who is to say that the water was not much higher than that, perhaps covering even the peaks of the mountains? You and I were not there but there is an eyewitness who was there. The Lord said "And the waters prevailed exceedingly upon the earth; and all the high hills, that were under the whole heaven, were covered. Fifteen cubits upward did the waters prevail; and the mountains were covered " (Genesis 7:19-20). Where Then Did All The Water Go? This is a logical question that certainly needs to be addressed. If all the high mountains under the whole of heaven were covered in the great Flood (Genesis 7:19-20), two questions come to mind. First of all, where did all the water come from? And secondly, where did all the water go? If we believe in the God of the Bible, we should have no reason to doubt that the Almighty could have just spoken, and a flood would sweep clean the earth. But the Bible gives us the answer. Where did all the water come from? The Bible tells us "all the fountains of the great deep [were] broken up" (Genesis 7:11). It appears that there were great aquifers or cisterns in the lower parts of the earth that were "broken up" . This undoubtedly would have resulted in great upheavals and much sedimentary deposition reconfiguring the face of the earth from any likeness it may have had before the flood. The Psalmist said, when the floodwaters arose, the mountains did "shake" and were "carried into the midst of the seas" (Psalm 46:2-3). Job said that the waters "overturned the earth" (Job 12:15). The "windows of heaven were [also] opened" (Genesis 7:11) and it rained "forty days and forty nights" (Genesis 7:4). Since we have never seen such a worldwide catastrophe in our day, one might question, how could that much water precipitate out of the sky? If all the rain precipitated out of all the clouds in our atmosphere today, it would only amount to an average of 1-2 inches over the face of the whole earth. How then shall we answer this? Well, in the beginning, on the First Day of the Creation week, God created the heavens and the earth, and the earth was without form and void, and the earth was covered with water (Genesis 1:2). On the Second Day, God divided the water into two parts and He made a firmament (atmosphere) between the waters above and the waters below (Genesis 1:6-8). On the Third Day He caused dry land to appear out of the waters beneath the firmament and He called the dry land Earth (Genesis 1:9-13). Before the Flood then, there was a great body of water above our present atmosphere. This "water vapor canopy" would have provided a much more uniform temperature over the earth and a more stable environment than we have today. In fact, it would have caused a greenhouse effect that would have made the whole world more tropical. It would have likely blocked out any harmful ultraviolet rays, which are responsible for the many mutations and genetic defects that can harm the immune system of man leaving him susceptible to disease. Man lived for hundreds of years before the Flood (Genesis 5). In fact, the oldest man (Methuselah) lived to be over 900 years old, but shortly thereafter we see the length of mans life dwindle down to approximately 70 years (Genesis 11:10-26, Psalm 90:10) as it is today. The removal of this water vapor canopy could possibly account for the shortening of life after the Flood, as mutations and disease began to fester dramatically with these defects imputed and compounded in their offspring. That the whole world was tropical is evidenced by the mummified forests, with trees as high as 50 meters and stumps 2 meters in diameter, that are "found in their original estate" on Axel Heiberg Island, Nunavut, above the Arctic Circle. In Maclean's Magazine (September 6, 1999), it says that these forests existed in the Arctic Circle due "to a lengthy warm spell". Because they are "in a polar deep freeze, the plants and trees have kept their original form and tissue". This preservation could only have resulted by the rapid freezing of the Polar Regions before they rotted away. This rapid freezing is not hard to imagine if the waters from above the firmament were precipitated which would reduce the greenhouse effect, subsequently causing the north and south poles to freeze over very quickly. An article in New Scientist, 24 May 2003 stated that "the wood is believed to be 45 million years old". What is omitted from the article - wood from this tree has been dated by the C14 lab in University of Toronto, Canada, and gives a C14 reading indicating it is less than 41,000 years old. 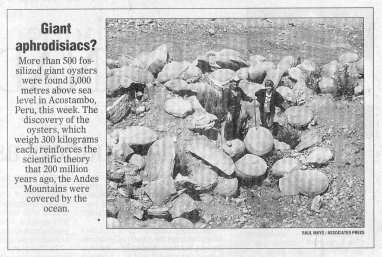 Another related article in Time Magazine (September 22, 1986) stated that there were 19 distinct layers of stumps (likely due to the layering effect of the Flood). "Each layer is a forest that developed, lived for many centuries and was overtaken by floods of sediments that killed the roots � they must have been killed off quickly for the roots not to decay, and buried deeply enough to exclude oxygen but not so deeply as to produce coal". Even the secular scientists have to conclude that there was likely a great flood that killed off the forest. While they date the forest at 45 million years, they have identified some of the trees as "dawn redwoods � now nearly extinct, surviving in only a few locations in China." National Geographic (February 2002) states, "Fossil discoveries reveal a warmer, greener Antarctic past. Cryolophosaurus, a carnivorous dinosaur lived ... in what are now the Transantarctic Mountains." They also state "riverborne sediments buried a tree on the Antarctic Peninsula. Its petrified remains (left), still stand on Alexander Island." Today lichens and mosses are Antactica's dominant plants and the largest land animal is a wingless midge about a half inch long. Indeed it appears that there has been some tramatic effect that changed dramatically the conditions that now prevail in Antarctica. We believe that the Bible has the only clear answer recorded by the only Witness who was there to observe and record what caused such a change, He is the Almighty God. And He tells us through His inspired Word found in the Bible, that "the world that then was, being overflowed with water perished" (2Peter 3:6). Notice the relative size of this fossil tree compared with the hammer on the lower left hand side of the picture. Other evidence also points to the fact that the Arctic regions were once tropical. Fossilized coral is found in parts of the Polar Regions today, which would necessitate warmer waters (20 Celsius) than are now there. Also, coal seams are found near the poles, which is an indicator that abundant subtropical vegetation once grew there. That there are large amounts of water yet frozen in the Polar Regions today is evident by the concern scientists have with global warming. Some speculate that if the globe were to increase an average of 1-2 degrees, much of the polar ice would melt flooding many of the world's coastal cities (Time Magazine April 9, 2001). A National Geographic article states "If Antarctica's ice all melted, the world's seas would rise some 250 feet, engulfing New York Harbor's Statue of Liberty to the nose" (National Geographic, October 1963, page 276). But the ice caps are not where the bulk of the water is today. Water covers 70% of our world with some of the oceans as deep as six miles. If the earth was smoothed out and the mountains leveled into the sea, the earth would be covered with water almost two miles deep. Where is the water from the flood? It is in the sea. After the flood the mountains ascended and the valleys descended, and the waters drained down by the valleys into the sea that was "founded" for them. The Genesis Flood would certainly explain the evidence of marine fossils and water-laid sediments at the summits of the highest mountains today. The Bible tells us that Jesus Christ is coming back again (John 14:1-3, Acts 1:11, Hebrews 9:28, 1John 2:28, Mark 13:32-37), and when He comes He will restore all things (Acts 3:19-21) to their original state before the fall of man. The topography and the atmosphere of the earth will once again be restored to their pre-flood state. The prophet Isaiah spoke long ago, and John the Baptist confirmed that " Every valley shall be exalted, and every mountain and hill shall be made low: and the crooked shall be made straight, and the rough places plain: And the glory of the LORD shall be revealed , and all flesh shall see it together: for the mouth of the LORD hath spoken it" (Isaiah 40:4-5, Luke 3:4-6). This He will do during the great Tribulation when "the glory of the LORD shall be revealed". "And there were voices, and thunders, and lightnings; and there was a great earthquake, such as was not since men were upon the earth, so mighty an earthquake, and so great � And every island fled away, and the mountains were not found" (Revelation 16:18, 20). The mountains shall be "cast into the sea" (Matthew 21:21). But if this were so, the waters would flood the world over. The waters will also need to be taken care of. The Lord will also bring a great plague of "great heat" that will scorch the earth with the sun so greatly that even the great Euphrates will be dried up (Revelation 16:8-9, 12). It is likely then that much of the oceans of the world at this time will be returned back from where they came, above the atmosphere to form again that great water vapor canopy. The Lord is coming back again, but when He comes, He will judge the world in righteousness "when the Lord Jesus shall be revealed from heaven with his mighty angels, In flaming fire taking vengeance on them that know not God, and that obey not the gospel of our Lord Jesus Christ: Who shall be punished with everlasting destruction from the presence of the Lord, and from the glory of his power; When he shall come to be glorified in his saints, and to be admired in all them that believe (because our testimony among you was believed) in that day" (2Thessalonians 2:7-10). "God � now commandeth all men every where to repent: Because he hath appointed a day, in the which he will judge the world in righteousness by that man whom he hath ordained; whereof he hath given assurance unto all men, in that he hath raised him from the dead" (Acts 17:30-31). There is a judgment day coming when all shall stand before the Creator of the world, in which they will be judged for their sins, for "It is appointed unto men once to die, but after this the judgment" (Hebrews 9:27). But there is good news, and it is this, there is "no condemnation (or judgment: same Greek word) to them which are in Christ Jesus" (Romans 8:1). The fact of the matter is that the sentence of death has passed upon every man for "all have sinned, and come short of the glory of God" (Romans 3:23). But Jesus Christ "died for our sins according to the scriptures � he was buried, and � he rose again the third day according to the scriptures" (1Corinthians 14:1-4). "The Lord is not slack concerning his promise, as some men count slackness; but is longsuffering to us-ward, not willing that any should perish, but that all should come to repentance � And account that the longsuffering of our Lord is salvation" (2 Peter 3:9, 15). If you have not believed on the Lord of Creation as your Saviour, change your mind right now and receive Jesus Christ as your very own, and He will save you from your sin. His substitutionary death was the only ransom that could pay for our sin. He promises, "He that heareth my word, and believeth on him that sent me, hath everlasting life, and shall not come into condemnation; but is passed from death unto life" (John 5:24). Stand on the promises of God. Trust only in the Lord Jesus Christ and His death and ressurection on your behalf today. There is no other payment that will suffice for your sins, and none other name under heaven whereby we must be saved. "That if thou shalt confess with thy mouth the Lord Jesus, and shalt believe in thine heart that God hath raised him from the dead, thou shalt be saved. For with the heart man believeth unto righteousness; and with the mouth confession is made unto salvation. For the scripture saith, Whosoever believeth on him shall not be ashamed. For there is no difference between the Jew and the Greek: for the same Lord over all is rich unto all that call upon him. For whosoever shall call upon the name of the Lord shall be saved" (Romans 10:9-13). Call upon Him today.